David C. Mitchell is a Biblical scholar, archaeomusicologist and the author of the influential The Message of the Psalter released back in 1997. In The Songs of Ascents, he applies these skills to create a fresh and novel study on Psalms 120-134. Though he calls it a “commentary”, one soon recognizes a book that surpasses expectations from this label by encompassing ancient Israelite worship. If this still sounds too narrow or abstract, let me spoil the ending: this would have been a strong contender for my favourite book of 2015 if I had read it before the end of the year. Mitchell aims to recover the ancient music of the Songs of Ascents. Upon first skimming through the book, I was shocked to see sheet music for each Psalm that attempts to capture the original music. Mitchell argues that the music of the Psalms is recoverable; this is “the first Psalms commentary to attempt a printed version of the ancient music of the Psalms” (x). Many studies have attempted to reconstruct theoretical settings for individual Psalms, while others have reacted by focusing only on the text. Mitchell avoids both paths and attempts to “reconstruct the ritual and liturgical context in which the Songs of Ascents were first sung” (x). He goes so far as to propose not only the single event for which they were created, but an exact date, even to the hour, of when these songs were first sung! Mitchell considers the different layers to these Psalms, such as historical events that lay behind them (Davidic covenant in Ps 132, situation of the kingdom at the time, etc) but also how they were later used prophetically. In their placement within the Psalter context, they contributed to the Messiah’s coming kingdom. Finally, numerology, or gematria, is employed. Though modern biblical scholarship has generally avoided gematria due to abuse and excess, Mitchell argues that “it has always been intrinsic to rabbinic interpretation” (x) and that it plays a significant role in the Ascents that shouldn’t be ignored. Over the course of fifteen chapters, Mitchell examines the Ascents from different perspectives. In chapter one, the Songs of Ascents are seen as their own collection, within a collection (Psalter), within a collection (Bible). Unique features include a focus on Zion, a meta-narrative flow, and intentional structures. In chapter two, restrained numerology (gematria) is applied to reveal surprising “encoded messages” within the collection (p15). Chapter three explains that ma’alot is translatable as either “ascents” or “steps”, and thus applicable both to pilgrimages to Jerusalem and also the 15 steps of Solomon’s temple. Chapter four surveys the options for when this collection was written and compiled, and concludes that only the period from Solomon’s temple until his death (959-930BC) matches the details. So what period in Solomon’s reign would provoke this collection? Chapter five lays the foundation for Mitchell’s argument by giving a history of the ark, while chapter six answers the question by arguing that the Ascents form the liturgy of the ark’s entry into Solomon’s temple (see Ps 132). Chapter seven explores the authorship of these Psalms, suggesting that the ten anonymous Psalms are the work of Jeduthun and the Merarite Levites. Chapters eight through thirteen form a larger unit in the book devoted to the music of these Psalms. Chapter eight begins with the temple musicians and their instruments, while chapter nine is about singers and cantillation. Chapter ten uses rabbinic literature to recreate the Sukkot liturgy before AD70, and uses this as a lens to imagine that of Solomon’s time. Chapter eleven surveys the recent attempts to recover ancient melodies of the Psalms through the Masoretic cantillation, and chapter twelve explains how these are deciphered and applied in modern musical theory. 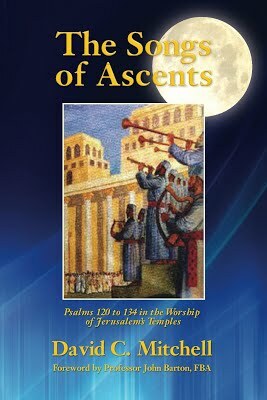 In the longest chapter of the book, chapter thirteen provides sheet music for each of the 15 Ascent Psalms and a few pages of commentary that incorporates musical and liturgical insights. Chapter fourteen asks the question of why these songs were preserved if the kingdom, king, and temple were all gone when the Psalter was completed. The answer: these Psalms take on new eschatological hope for the ingathering of God’s people to Zion, according with the hopes passages like Zechariah 14:16, Micah 4:2, and Isaiah 2:3. Chapter fifteen concludes the book by explaining the relevance of the Psalms for today and the power of music. Four appendices explore the name of YHWH, the historicity of Solomon’s temple, the Hebrew calendar, and the debated meaning of the two cantillation marks. As I said at the beginning of the review, this is one of the best books I have read recently. It opened my eyes in many ways and was filled with provocative insights and suggestions. I was surprised how fruitful and frankly, fascinating, a study of ancient music and liturgy could be and how much could be known. Some of Mitchell’s suggestions are controversial and even idiosyncratic, but how else would one propose new ideas? I find the majority of the unique arguments within The Songs of Ascents compelling, and mostly convincing. His suggestion for the origin and purpose of Psalms 120-134 makes perfect sense and filled these Psalms with fresh significance. It’s stunning how a close reading of these Psalms can lead to not only the event for which these were composed, but even the day and hour of when these songs were first sung. Beyond the Ascents, one finds comprehensive information (with illustrations) about ancient worship, making this a useful resource for other texts referencing instruments and worship. This says nothing of the several rabbit trails, such as the discussions regarding the proper pronunciation of YHWH, or the current location of the ark (yes, you read correctly). As if the heart of the book were not interesting enough as it is, these diversions are fascinating and provocative. More than most I’ve read recently, The Songs of Ascents inspired numerous study detours before I could return to the book. Most importantly, through a detailed study of Psalms 120-134 and a survey of ancient Israelite worship, I can say I understand Scripture better. Small niggles, such as a lack of Scripture index, some noticeable typos, and common references to Psalms without specifying verse numbers, are unfortunate but hardly detrimental. The Songs of Ascents deserves a wide audience. Those interested in the Psalms and/or ancient music and liturgy, with a basic knowledge of Hebrew and a decent understanding of musical theory, will glean the most. However, I wish that all Christians would read this book as it opens up Biblical concepts and no doubt covers neglected blind spots in our understanding of ancient Israelite worship. Since the Psalms is one of the most popular books of the Bible, plumbing its depths is never a wasted opportunity.